At Markham Steeles Dental Centre in Scarborough, we use cosmetic dental bonding as a low cost way to fix a broken tooth, close gaps, fill cavities and more. Cosmetic bonding is a lower cost technique that can improve the appearance of your smile. 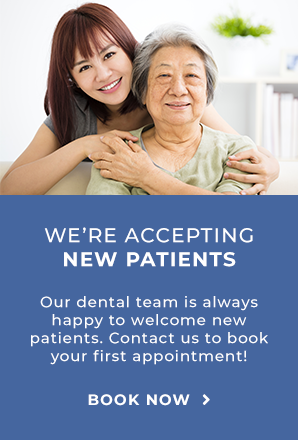 Our dentists at Markham Steeles Dental Centre may recommend cosmetic bonding to close tooth gaps, fill cavities or fix spots, chips and discoloration. It’s also good option to quickly fix a broken front tooth. During the cosmetic bonding procedure, our dentist first uses a plastic matrix, or thin guard, to protect the neighbouring teeth and ensure only the tooth that requires the bonding is exposed. Then, they apply a gentle chemical that makes the tooth a little rough, so the bonding material will stick better to your tooth. Layers of the dental composite material is applied directly to the tooth, with the dentist using a blue light to harden the bonding resin between each layer. When the final layer is applied, it is then shaped and polished in to a natural looking shape that matches your smile. What is cosmetic bonding made of? The dental composite used for cosmetic bonding is made of particles like silicon dioxide or quartz, bound with a tough synthetic resin. It is blended into different shades, toughness, and translucency to match the natural colour of your teeth.